Donald Knuth’s 80th=0x50th birthday was on January 10. In the array of his birthdays, numbering from zero so that stands for his birth day in 1938, that was indeed . However, as the 81st entry in the array it might have to be called his 81st birthday. Oh well. Today we salute his 80th year—wait, it really is his 81st year—and wish him many more. People are often tempted to write instead of because the terms for , , and in this sum are zero. … But such temptations should be resisted; efficiency of computation is not the same as efficiency of understanding! …[S]ums can be manipulated much more easily when the bounds are simple. … Zero-valued terms cause no harm, and they often save a lot of trouble. This was almost 25 years ago but Don’s advice is still a step ahead today. I (Ken) used to think that only chess held marquee events up near the Arctic Circle: the 1972 match between Bobby Fischer and Boris Spassy in Reykjavík, Iceland; the 2014 Chess Olympiad in Tromsø, Norway. The January 8–10 workshop and celebration for Don’s 80th birthday was organized in Piteå, Sweden, which is just north of 65° latitude. We have elided one of Don’s words, and we’ll keep you in suspense about it, but for a hint it’s the kind of suspension. Which is one of the more difficult things I’ve ever had to do in plain TeX, because WordPress does not recognize fancy add-ons to LaTeX (nor even the \TeX or \LaTeX macros). Sunset was observed during the lunch break—this was the Arctic Circle in early January, after all. There followed the talk on TeX by Haralambous, a tribute by Don’s son John Knuth, and a brief introduction by Jan Overduin to the signature event of the day, which took place after the cutting and serving of the birthday cake. The word apocalypse comes from Greek apo- “away” and kalupsis “covering”—that is, a revelation. As the original Greek name for the Book of Revelation it acquired its connotations of catastrophe and final destruction. What we now consider to be apocalyptic writing goes back at least to the fall and Babylonian exile of Israel and Judah. But the primary element of revealing hope sets Revelation apart—except that its germ is in the last chapter of the book of Daniel. He got it going in early 2011. So January 10 saw the world premiere of his Fantasia Apocalyptica on the Orgel Acusticum, whose official page begins by saying, “This is an instrument for the 21st century.” It was built in 2012 by Gerald Woehl. A year ago, Don visited it in Piteå and wrote an incredibly detailed exegesis, including the organ’s software features and controls. 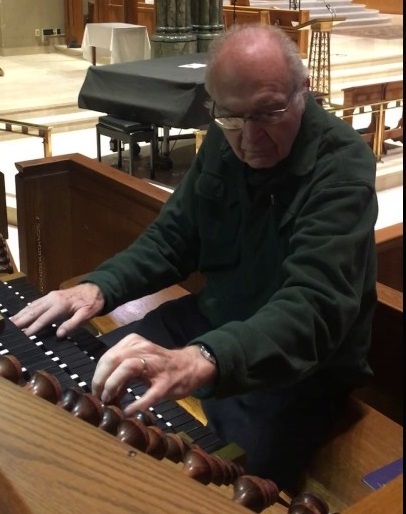 You can hear parts of it in an introductory video by the Canadian organist Jan Overduin, who performed it in Piteå and will do so again on November 4 at his home First United Church in Waterloo. This video is atop Don’s own page which includes his full score in manuscript and typeset forms. However, what I (Ken) think of as the highest example of constrained writing is translation. Insofar as they give scope for the translator’s own creativity, they are constrained by faithfulness to the source text. Creative choices come because meaning and imagery and emotion require different mixings in different languages and media. The Fantasia Apocalyptica is organized into one movement for each chapter of Revelation, and each movement follows the verses as Overduin expounds. It is thus a musical translation at perhaps a finer grain than many tone poems that have been based on literary works. With “fine-grained” as well as “constraints” we have circled around to computer-science concepts again. If there is one over-arching point we see Don conveying, it is that such integration of informatics with arts and language and real-life appreciation should be natural. We wish Don many more birthdays to come, no matter how they are numbered. Knuth is, among other things, scholarly. In his books he gives citations even for exercises (who came up with the problem), full names of all people, meticulous history, and so on. When writing an article on Ancient Babylonian Algorithms, he compared German and French translations (https://pbs.twimg.com/media/DIH4cevUAAAPsiZ.jpg) and learned Akkadian and Sumerian!